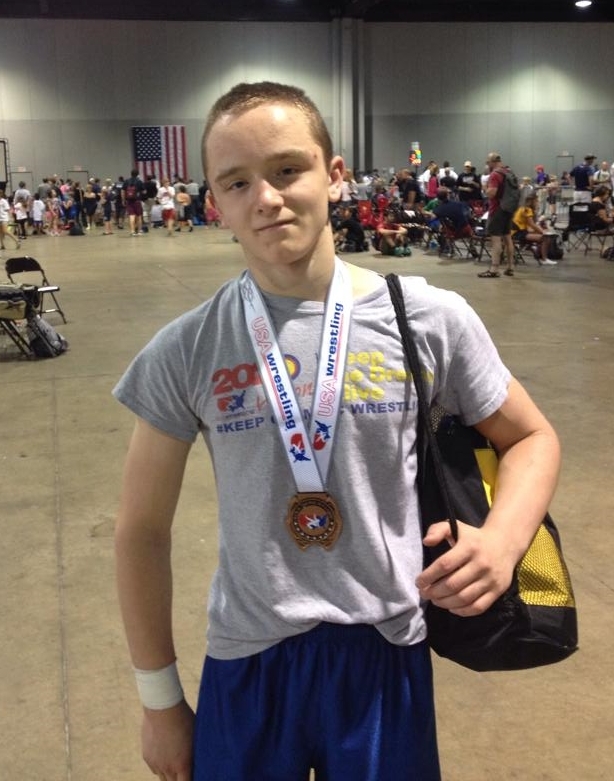 Twenty-nine Louisiana wrestlers travelled to Atlanta, Georgia, over the weekend to participate in the 2014 USA Wrestling/Cliff Keen Southeast Regionals. 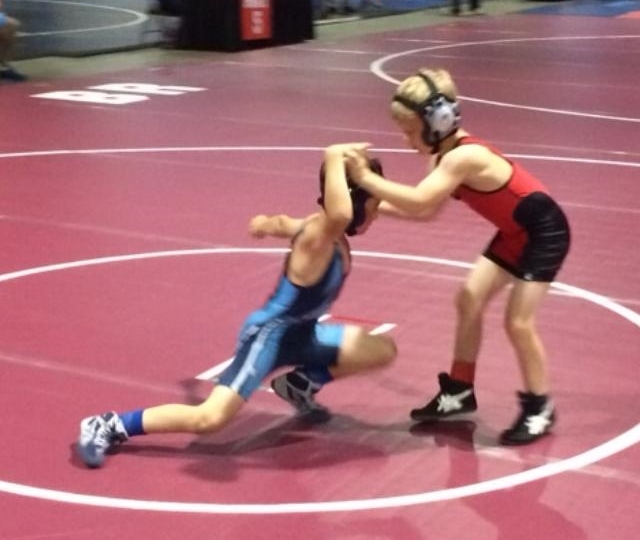 The event, held at the Georgia World Congress Center, included freestyle, Greco-Roman and, for kids in the Pee-Wee through Schoolboy age categories, folkstyle competitions. The wrestlers represented clubs from all over Louisiana: the Ascension Wrestling Club, B.R.A.W.L., the Bronco Wrestling Club, the Live Oak Wrestling Club, the New Orleans Wrestling Club and the Northeast Louisiana Wrestling Club. Soon-to-be-junior Guy Patron, Jr. (photos left), the 2014 Division I 182 lbs. 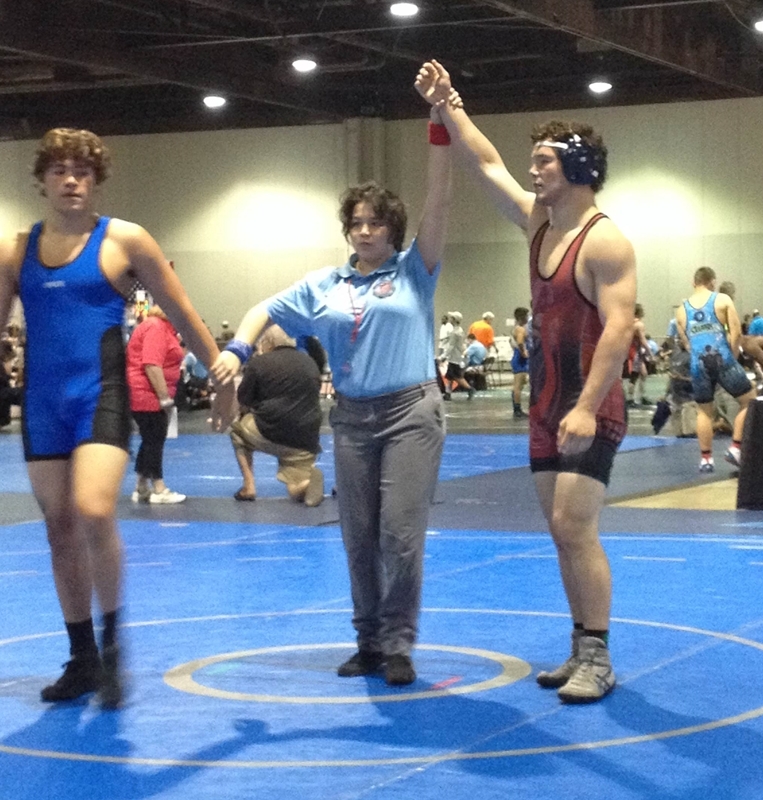 state-runner-up from Jesuit High School representing the New Orleans Wrestling Club, captured both the Cadet freestyle and Greco-Roman titles at 182 lbs. In his six matches Patron scored three falls and three technical falls while only allowing his opponents to score four points against him. In Saturday's Greco-Roman competition Patron defeated Georgia's Nicholas Whitmire in 1:48 and followed that with a 13-2 technical fall over Robert Winters, a fifth-place finisher at the Virginia's 6A state championships. In the finals Patron needed all of 12 seconds to pin Florida's Corey Harvey. On Sunday Patron started with a 10-0 technical fall over North Carolina's Ramon Rodriguez. He then faced Winters again, but this time pinned the Virginian in 44 seconds. In the finals Patron faced Georgia's Class 2A fifth-place state finisher Aiden Jarrett, whom he teched 13-2. The wins guarantee Patron, Jr., eligibility for national freestyle and Greco-Roman events later in the summer. Rayden Ingram (1st Folkstyle and 3rd Freestyle), Joshua Kennedy (6th Folkstyle), Anthony Dodson (3rd Folkstyle, 2nd Greco and 5th Freestyle), Camdyn Ingram (2nd Folkstyle and 5th Freestyle), Colt Olinde (3rd Greco and 4th Freestyle) and Jacob Kennedy. Patron's Jesuit teammate, senior Efosa Eboigbe (photo left from the 2013 Trey Culotta finals), took second place in the 160 lbs. Junior freestyle competition. After a first round bye Eboigbe got past Georgia's DeMarco Gatti, a 6A third-place state placer, 10-6. Eboigbe then registered falls of 3:57 and 5:56 over Florida's Julian Hernandez and Gavin McBride of Illinois, respectively. Florida's Dakota Greene, a 2014 Class 2A state champion from Brandon High School, got the best of Eboigbe in the finals, but the runner-up finish was enough to qualify Eboigbe for nationals competitions. Also qualifying for nationals, in the Junior Greco-Roman division at 113 lbs., was Live Oak's reigning Division II 106 lbs. 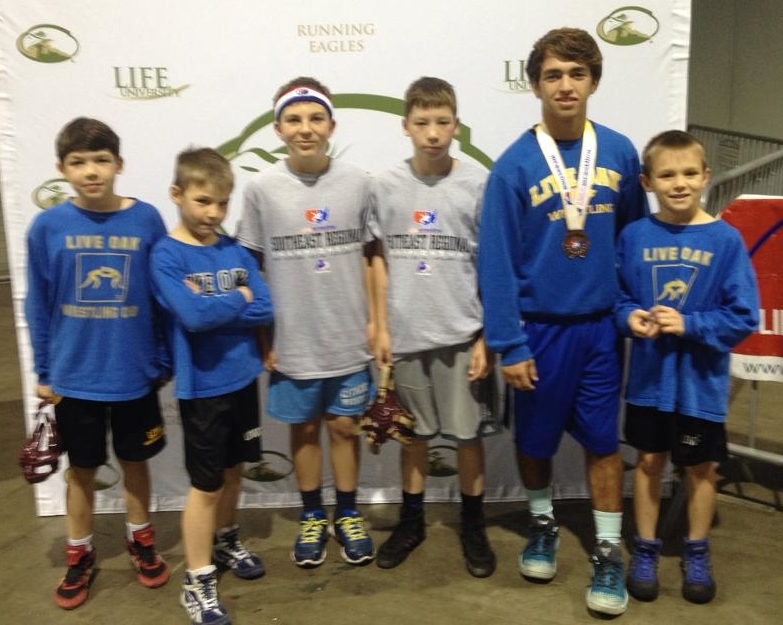 state champion Colt Olinde (photo left from the LHSAA state championships), representing the Live Oak Wrestling Club. Olinde lost his first match to Florida's Nicholas Walker in the Greco-Roman competition, but rebounded with a 10-0 technical fall over Deven Acevedo, also from Florida, and placed third with an 8-1 victory over Alabama's Arick Shankles. In the freestyle competition Olinde again lost his first match, this time to eventual champion Toribio Navarro of Tennessee (Navarro also won the Greco-Roman competition with a win over Walker). He then defeated Couth Carolina's Caleb O'Quinn in 26 seconds before falling to Acevedo in the consolation finals in a tough 19-14 match. East Ascension's Sidney Mitchell, competing for B.R.A.W.L., captured fourth place in the 152 lbs. Greco-Roman Cadet division, posting 38 second win over Georgia's Skyler Schuman and a 14-4 over fellow Louisiana competitor Tristan Norwood (Bronco Wrestling Club) before falling to the "true third winner" Mitch Dean of North Carolina. Norwood made it to the semifinals with a 10-0 win over Georgia's Austin Kennon, which vaulted him to the consolation semifinals and a sixth place finish. 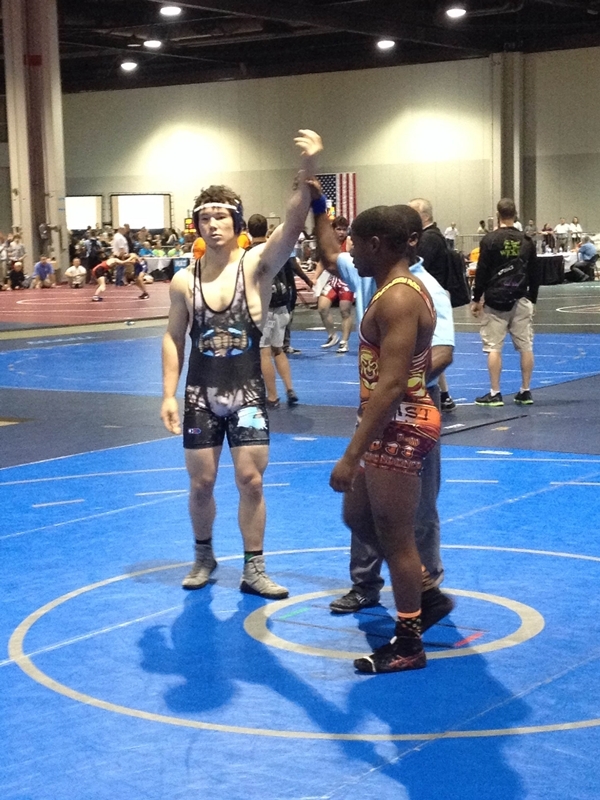 In the freestyle competition Mitchell lost his first match but came back to again defeat Norwood and then scored a 19-9 TF over North Carolina's Trey Merritt to reach the consolation semifinals. A loss there relegated him to a fifth-place match against Georgia's Felipe Hayes, who won a 10-0 decision to drop Mitchell to a still well-earned 6th-place finish. Two other Jesuit grapplers, representing the New Orleans Wrestling Club and looking forward to their sophomore seasons, had very good tournaments at the Cadet level. Jake Rando at 138 lbs. (photo left from the LHSAA state championships) used a bye and a 5:32 fall to reach the Greco-Roman semifinals, but suffered a cut over his eye which forced him to withdraw from that event. In the freestyle competition, after a 10 TF in the first round, Rando lost to Tennessee's Thomas Brackett in 1:55. But the young Blue Jay came back strong in the 16-man weight class with technical falls of 10-0 and 20-9 prior to a loss in the consolation semifinals. In the match for fifth-place, however, Rando exacted some revenge on Brackett by scoring an 18-7 technical fall. At 120 lbs., in a somewhat daunting 28-man bracket, Jordan Giewat (photo left) lost his first match but then won five matches in a row via falls (2:28, 1:02, 2:03, 2:43, and 1:12) before succumbing in the consolation semifinals and the match for fifth-place. In all, Giewat was 5-3 in his EIGHT matches on Sunday. 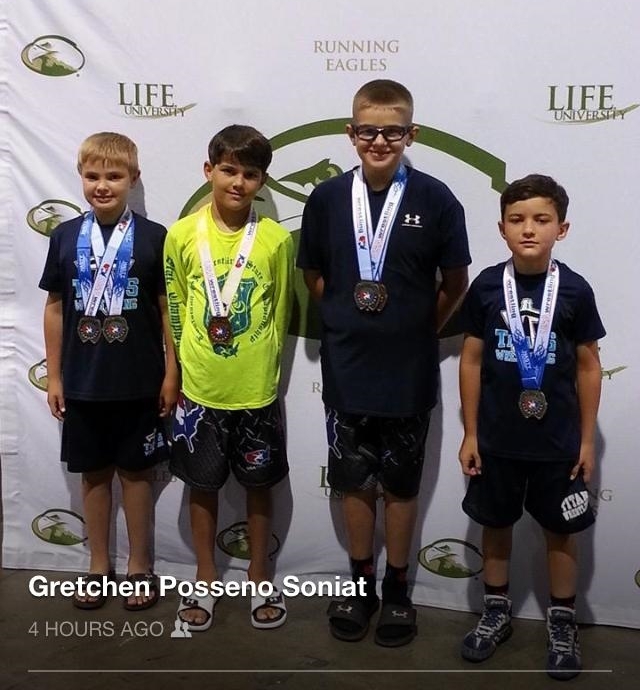 Ascension Wrestling Club Titan medal winners: Owen Soniat, Peyton Ward, Gavin Soniat and Nathan Ward. The best finish of the day by a grappler not yet in high school went to Nathan Ward of the Ascension Wrestling Club. Wrestling in the Bantam 65 lbs. division, Ward pinned his first opponent in 37 seconds before falling to the eventual winner, Robert Kucharczk of Virginia. Ward came back with a 10-0 TF over Georgia's Colton Schuette and then survived a 10-9 match with Florida's Jose Guiterrez to guarantee third place. Ward, however, had not met the winner of the other half of the bracket (who lost to Kucharczk 12-0), and in a match for second place Ward prevailed 8-4. Louisiana provided their share of the officials, also. Cody Hesser was the tournament clinician. James Stinson filled one of the head officials positions and Ian Ballantine, Zack Lawson and Fontainebleau Coach Rick Zimmer served as officials.